Happy Valentine’s Day! 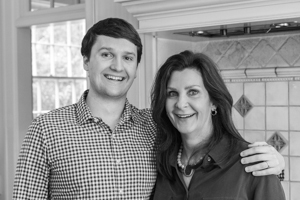 Earlier in the week, Sally shared with you a recipe that is great for a Valentine who prefers the savory to the sweet. Today, we have a recipe that will appeal to any taste buds. Why not extend your Valentine’s Day into the weekend? 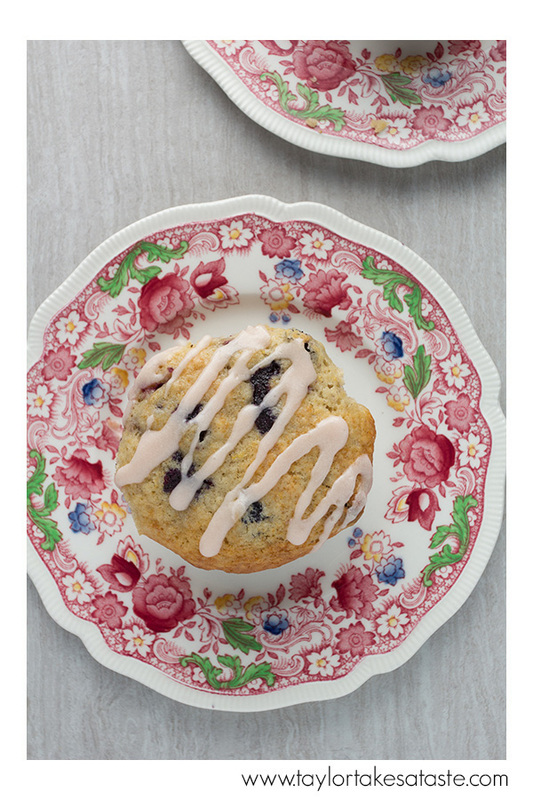 These Blackberry Blueberry muffins are the perfect item for a weekend Valentine’s Day breakfast or brunch. You can make them for your loved one, or have the whole family join in! Kids will enjoy decorating with the Blood Orange Icing in a design of their choosing. Have a great Valentine’s Day weekend! 1. Preheat the oven to 350 degrees. Spray a 12 cup muffin pan with non stick cooking spray. Line the pan with muffin papers. Set pan aside. In a large bowl, add the flour, baking powder, salt and allspice. Stir to blend. 2. Add the blackberries and blueberries to the flour mixture and stir until the berries are coated with flour. Set the bowl aside. In a medium bowl, add the sugars and eggs. Stir to blend. Add the milk, vanilla and zest. Stir to blend. Add the melted butter and stir until well mixed. Immediately add the milk mixture to the bowl of flour and berries. Stir the muffin batter until just blended (some lumps in the batter are desired). Divide the batter evenly among the prepared muffin cups. Bake for approximately 25 minutes or until muffins have risen and are a light golden brown. Remove the muffins from the oven. Cool on a wire rack. 3. To make the glaze, put the 2 Tablespoons of butter into a small bowl. Add 1/3 of the confectioners sugar and stir until a thick paste has formed. Add the orange juice, vanilla and salt. Stir until well blended. Add the next third of the sugar and stir until well blended. Add the remainder of the confectioners sugar and stir until icing is well mixed. Remove the cooled muffins from the pan. Drizzle the muffins with the icing.There is enough icing to cover the top of each muffin, if desired. Return the muffins to the wire rack until the icing has dried. Serve muffins. 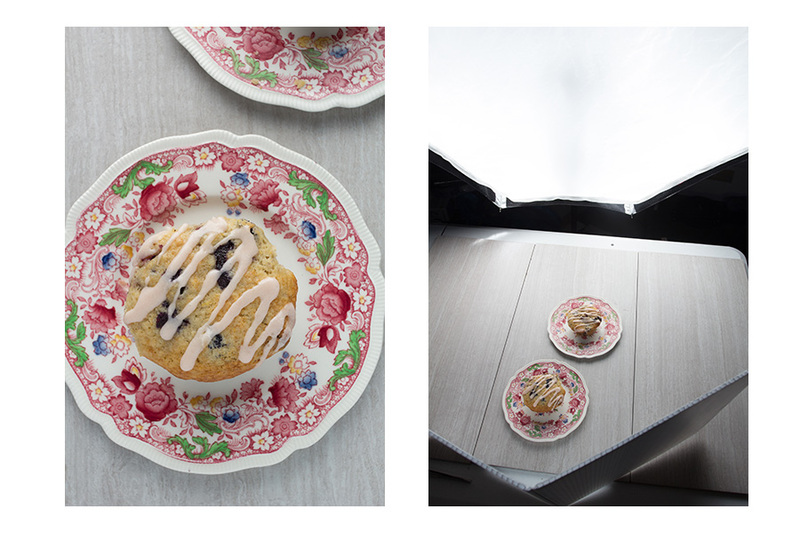 Above is the set shot for the Blackberry Blueberry Muffin shot. Once Sally prepared the muffins, it wasn’t too complicated to style and light them. We decided to use a plate that had a Valentine’s Day feel with out being too full of hearts and cupids. The lighting set-up was created with my light source placed behind the subject and a reflector placed in front of the subject. The final shot was taken from an overhead camera angle. When I am looking for a soft look with little contrast between the shadows, backlighting and filling the shadows in with a reflector is an approach I commonly take. 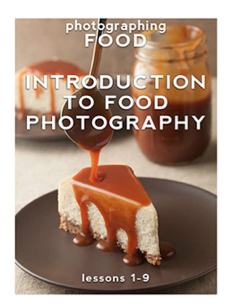 If you want to learn more about this technique, I cover it in great detail in the food photography educational series called photographing FOOD. This looks delicious! I’d love these for a Valentine’s Day breakfast in bed.